2 Recommendations are tagged with "Modeling Instruction"
What kind of whiteboards should I use? Whiteboards are a great tool for students to work out ideas individually and collaboratively, and to present those ideas. Based on reports from expert educators, this recommendation discusses the questions you should ask when choosing whiteboards, and the advantages and disadvantages of each type of whiteboard, product suggestions, and the advantages of whiteboards over other collaboration tools. 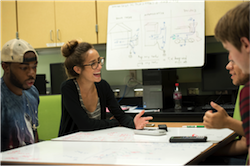 Whiteboards are an indispensable tool that physicists use to work out ideas individually and collaboratively, and to present those ideas, both for public discussion and critique of tentative ideas and for communication of more fully formed ideas. In this recommendation, we offer guidance for how to use whiteboarding effectively in your classroom.